snow damage to plants, prevent snow damage in your garden, Garden jobs for winter, jobs in the garden for winter, your garden in January, preparing the garden for Spring, Garden in winter, snow damage to plants, prevent snow damage in your garden, can snow damage plants. Pretty as the snow may be, there are situations where it can cause damage in your garden that will take some time to rectify. If you know what to expect, you can reasonably prevent snow damage in your garden, or at least the worst of it. Firstly, the weight of snow build up can bend and distort the shape of your ornamental shrubs. While the damage is not permanent it can take a lot of preparatory work and months of growing to restore the preferred form. It is very frustrating to have mis-shapen plants after the prolonged work getting the shapes right. 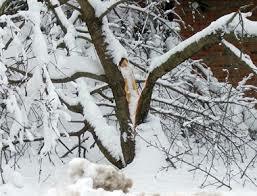 In extreme cases the weight of snow can cause branches to snap, a much more permanent type of damage . In this case prune out the damaged area before growth resumes in the spring. That snow lying on top of some plants can actually kill off the growth. This will leave large brown patches of dead leaves that will take up to a year to be replaced. Bay, especially if formed into a globe, ball or lollipop where snow can sit on top, are particularly vulnerable. To prevent snow damage in your garden you can use a broom or rake to shake off the snow. If the snow has settled and then frozen it will be harder to remove. If it has become ice then its best to leave it until the weather warms up. This of course assumes that the snow is an occasional visitor. If you get snow on a regular basis then a more pro-active approach is needed. This may involve gathering or binding shrubs together with tape, or covering with fleece. Even then it may pay to shake the snow off before it builds up. There are seemingly many rules to consider when pruning roses, so daunting that most people choose not to bother for fear of causing more harm than good. But some simple rose pruning rules applied at the right time will easily enhance your roses regardless of what they are. Consider first, does the rose flower just once? If so prune in late summer after flowering is completed. The objective is – as with all pruning – to keep the plants free of dead, diseased and damaged wood (the three D’s). Crossing or rubbing branches and spindly growth should also be removed. Avoid any excessive build-up of the older, less productive wood that can crowd out the centre of the plant. Opening up the plant to form a goblet shape is the plan. Remove older branches from the centre if necessary. If they become leggy and bare at the base, remove one or two stems back near the ground to encourage new growth from the base. If on the other hand, you don’t know if the plant flowers just once, prune your roses in February to March. Use the simple rose pruning rules below, as described by the RHS. The idea here is to make the cuts before the plant breaks dormancy in the spring. Cuts should be no more than 5mm (¼ in) above a bud and should slope away from it, so that water does not collect on the bud. 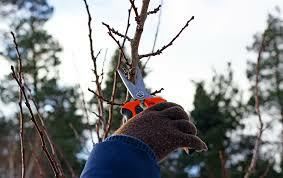 This applies to all cuts, whether removing dead wood, deadheading or annual pruning. Cut to an outward-facing bud to encourage an open-centred shape. With roses of spreading habit, prune some stems to inward-facing buds to encourage more upright growth. Make your cuts clean and neat using clean and sharp secateurs. 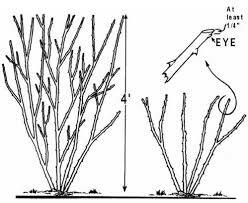 For thicker stems use loppers or a pruning saw. Prune and dieback to healthy wood. Cut out dead and diseased stems and spindly and crossing stems. Aim for well-spaced stems that allow free air flow. Trace suckers back to the roots from which they grow and pull them, rather than cut them, away. So there it is, simple rose pruning rules that we can all follow to keep your roses easily maintained, and enhanced. From the ground up can show you how to prune your roses and other shrubs. And if you need any extra guidance, search the RHS website for rose pruning, where everything is explained very clearly.